Hooray! It's Sew Grateful Week, the annual event launched by Debi of My Happy Sewing Place, and today is Giveaway Day. I'm grateful that I have time to sew, even if I sometimes don't think I do. I'm grateful for all the people out there who post tutorials, patterns, reviews, and inspiration. I'm grateful for the people who taught me to sew (that's you, Mom!) and the people who enable me to keep at it (that's you, Ian!). And I'm grateful for these giveaways. See, a couple decades ago my grandparents did some world travel. My grandfather took an enormous video recorder to Australia, back when such things rested on your shoulder and didn't live in your phone. No idea how he did that. Somewhere along the way, my grandmother bought some fabric, silk from Thailand, a gift for my mom. The colors didn't quite suit, and the fabric has lived in its gift box for years. Eventually the fabric came to me (the colors don't suit me, either). Because of Sew Grateful Week and the annual giveaway, I can be sure that this fabric will find quality new homes with people who will know what to do with it. Which is so much more satisfying than taking it to Goodwill! The first fabric is on the crisper side - I don't know a lot about silk as I tend to work more in cotton. It might pleat well? 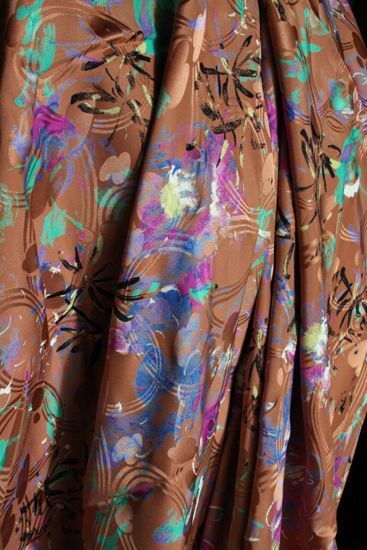 Anyway, it's heavier than what I think of when I think "silk" - definitely not drapey blouse material. 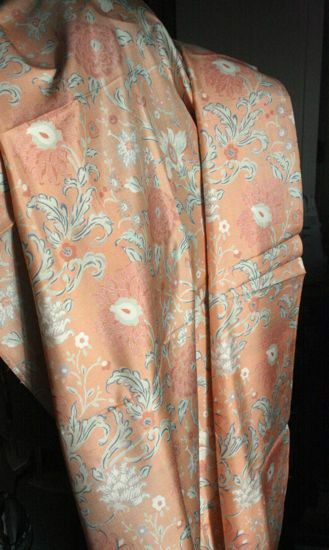 It's a peach color with flowers, and there is about four yards of it. This one, on the other hand, is all kinds of drapey. It wants to hang in soft folds - no pleats here. It's darker than the other, more bronze than peach, with texture woven in and splashes of color. The black may be calligraphic characters or may be birds. The piece is roughly two yards. As far as I know, both fabrics are silk, both are from Thailand, and both are circa late 1980s/early 1990s. And I'm giving them both away. Which one speaks to you? What would you make with it? 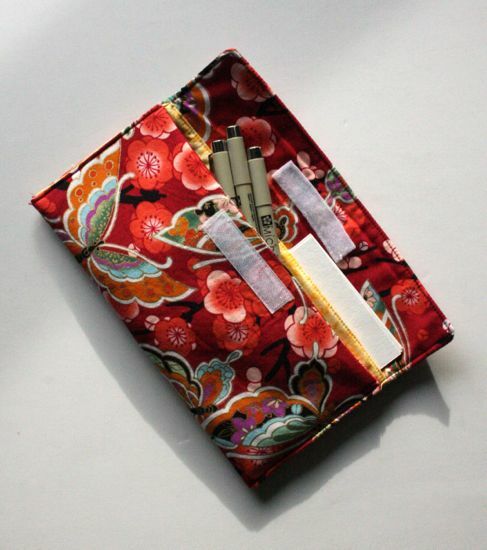 Not that it matters for the giveaway (I'm just curious), but have you sewn with silk before? I work primarily with cottons, both for quilts and clothing, so silk intimidates me. Random.org will pick a winner on Monday, March 3. I'll ship international, so all are welcome. Sometime the makes are small things. Fortunately, I'm not always working on things that are 10 feet long. I've extended the stashbusting theme to the box of yarn. Thus far, yarn hasn't been as much of a weakness as fabric, and I've been pretty good about keeping the yarn contained. The box is full, though, so most of my crochet projects have been about finding uses for the things I already have. Thank goodness for Ravelry's search features that let you look for things based on the amount and kind of yarn you have! These are "Tula's Mitts" and I used up some more of the yarn left over from this cowl which I apparently never blogged (the pattern is here and mine is gray, too). 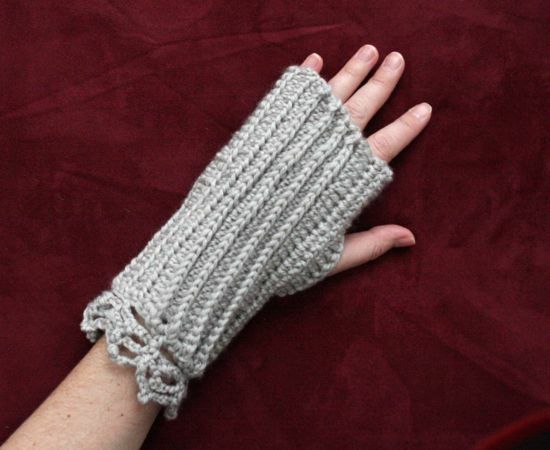 The mitts were a quick project and one I might do again, although without the lacy bit. I don't really like how that part came out - too fiddly. This utterly-impractical-for-snow hat is "Gloria's Happy Hat" from a free download from CrochetMe. The yarn is left over from this blanket. Don't ask why I had a skein of light blue and a skein of gray left over from that project but absolutely nothing of the navy. I'm not sure how much Caitlyn will actually wear this hat. It's more of a fashion accessory than a wear-it-and-be-warm kind of hat. She's always so enthusiastic to receive something (and has no problem requesting things - she has asked for her own version of this shawl which I made recently (no pictures yet)), but I wonder if the magic is in the receiving and less in the using. Also, I may have made the band a bit tight. My skills at correctly sizing yarn things need work. I'm hoping she gets more use out of this: Caitlyn's very own "Tangle Pocket", which I made for her for Christmas. It's a minor revision of the one I made for myself a couple years ago; this new one has the pocket added to the inside instead of sewn on the outside. 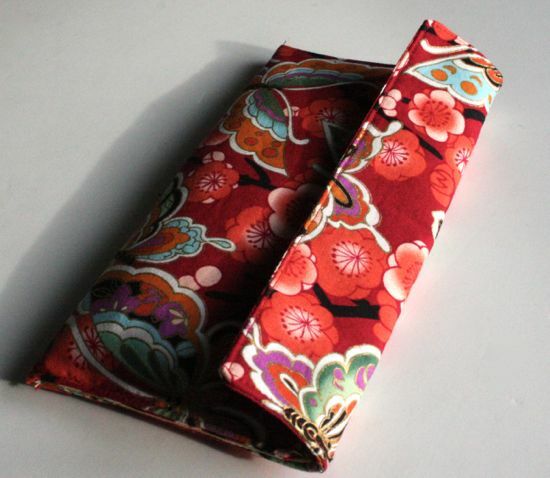 It holds the recommended Micron pens and a pencil in the wide pocket and has two tile pockets, one for blank tiles and one for finished Zentangles. Caitlyn's been exploring tangling with me on occasion; it might not last but at least she's got a space to store these things. I've got plenty of big projects, and always several things going at once. But sometimes it's nice to have a small thing that you can do and be done, yes? 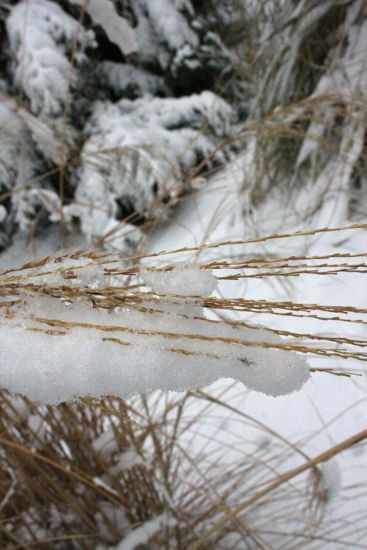 Despite our general northiness here in Seattle, we don't generally get snow. Thanks to Ye Olde Pacific, we get rain, wind, and cold, but not much snow. When it does, everyone celebrates (at least as long as it hasn't shut down the city - we've done that, too). 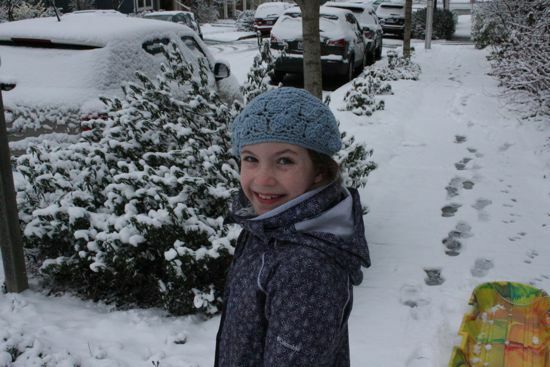 Last weekend we had perfect Seattle snow: just enough to make it pretty, not enough to cause problems. Although perhaps a half inch more would have been good. 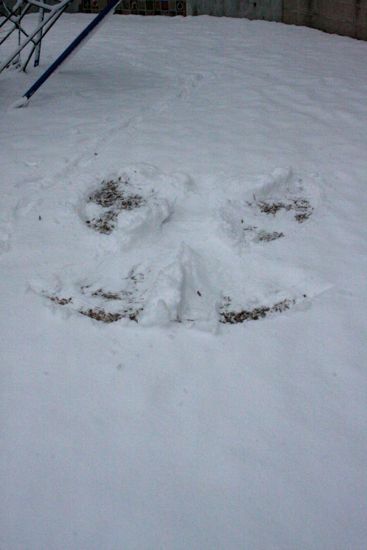 Just so Caitlyn's snow angel wouldn't be full of wood chips. She did make a grand effort at getting in some sledding. There was just enough snow for a few runs early in the day. 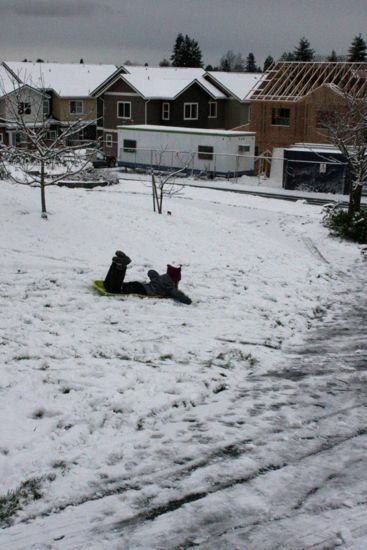 Sledding over emerging asphalt and peek-a-boo grass is, well, less than fully satisfying. 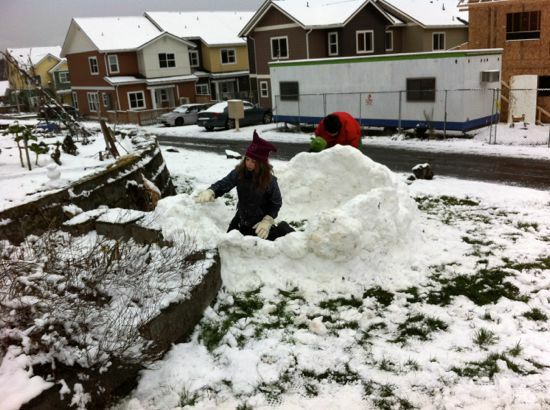 Since the sledding was substandard, Caitlyn convinced some other kids to help construct a snow fort. See that grass around the fort? 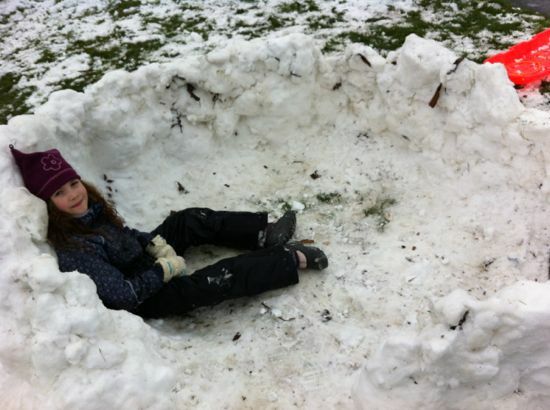 We nearly cleared the park of snow cover to build fort walls. I don't know enough about snow to know why Seattle snow doesn't often (in my experience, anyway) clump into nice snowballs. It tends not to be sticky; squeeze it in your hand and it just crumbles. This time, though, once you got a ball started it would hang together pretty well. Caitlyn oversaw a fort construction party that produced something probably close to 6 feet in diameter with walls about 3 feet high. Not bad, I say! Sometime last year I received an email from Capstone Press inquiring about a photograph on my site. I'd completely forgotten about the whole exchange. Last week, a box appeared on our porch. 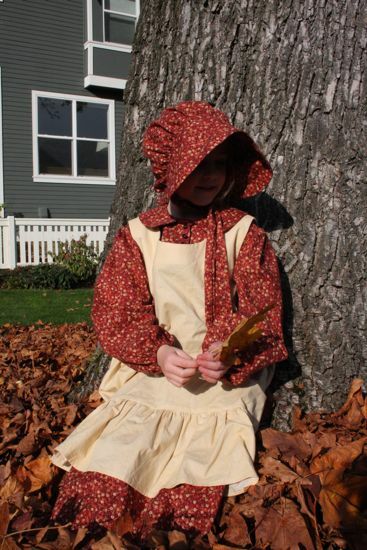 You can't tell that's my girl standing in for the actual Sarah Gillespie, but there she is, wearing the "olden times" Halloween outfit I made 3 years ago. Can I gloat just a little? The book is part of a new First-Person Histories series that uses diaries of real kids (approximately ages 10 to 16 or so) to make American history more than endless names and dates. 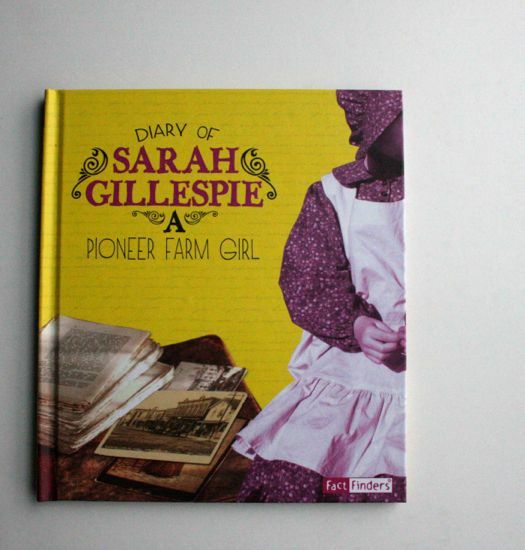 In addition to Sarah Gillespie, there's Carrie Berry (a Confederate girl), Charlotte Forten (an antebellum free girl), Sallie Hester (a covered wagon girl), Sally Wister (a Colonial Quaker), and William Bircher (a Civil War drummer, and the only boy in the set). The text is excerpted directly from Sarah's diary, complete with misspellings, optional capitalization and irregular punctuation. (I fully intend to point this out to Caitlyn: when you are writing for yourself, either to keep a personal record or to get a story down on paper, all the niggling mechanical details of writing can be totally ignored in favor of capturing your thoughts. Fixing mechanics is what editing is for, and sometimes editing doesn't happen.) 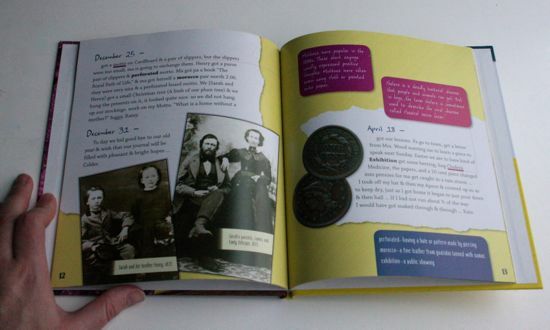 Capstone has augmented the diary with photos and explanatory sidebars, making the book a nice historical introduction and helping you to place Sarah's story in a somewhat broader context. When I showed Caitlyn the book, she was thrilled to recognize her dress on the cover. Her very own copy of the book now lives on her bookshelf. Since her face isn't included in the cover art, knowing that it's her feels ever so slightly like being in on something. I'm not doing a very good job of keeping the secret, am I?